During the cold winter months my skin has been terrible - lots of spots popping up and it was just looking so lacklustre and dull. 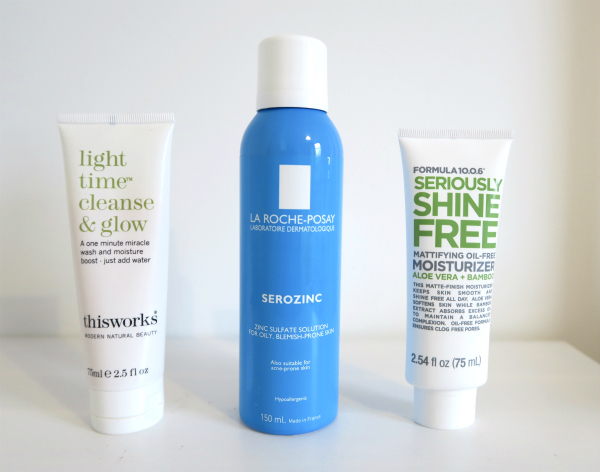 In the New Year, I decided that enough was enough and that I was going to get up 5 minutes earlier so that I could do a proper three-step skincare routine in the morning (I used to just wash my face and that was it). I've also been making the effort to drink lots more water and both of these things have improved my skin so much! 1) I've been using the This Works Light Time Cleanse & Glow to start the day. It's a brightening daily cleanser and I love it. You simply rub a small amount into your dry skin, and then use wet fingertips to massage into your face for one minute. You can leave it on for ten minutes for a really intensive cleanse but it's not recommended for sensitive skin so I just do it for a minute. You then rinse off and you're good to go. It makes my skin feel so clean and fresh. 2) Step two is a refreshing spray of the La Roche Posay Serozinc. This toner type product is great for oily/combination skin and I always feel like it's doing my skin good. 3) Final step is a moisturiser. I do swap these around a little but at the moment I'm using Formula 10.0.6 Seriously Shine Free Moisturiser. It's a gel like moisturiser which sinks into your skin super quickly and means that you have a great base for make-up. I can't stand the smell though! And that's it. Super quick and easy! My evening routine will be coming up soon.